Defending Swedish champs Stockholm opened the 2014 season taking a doubleheader from visiting Leksand, 6-5 and 9-3. 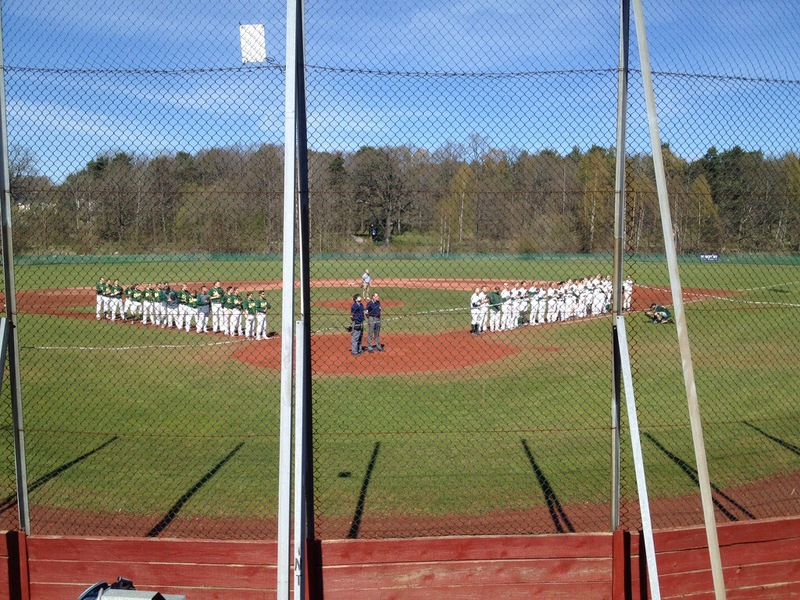 Leksand led the first game until the bottom of the ninth inning, when Stockholm tied with a bases loaded walk. The winning run came with the bases still loaded, with a batter hit by a pitch. Twice during the game Stockholm loaded the bases, then failed to score. One of the strangest plays came while Stockholm was issuing an intentional walk, when the home plate umpire called a balk. Spring Training is about to end, and the season has actually already begun, with the two games played in Australia by the Dodgers and the Diamondbacks. And yet again, while basically a wonderful service, MLB.tv is still disappointing. Why can’t we watch Team Australia’s triumph? When they got to Australia, both the Dodgers and the Diamondbacks warmed up by each playing Team Australia. But while both games, broadcast by ESPN, were carried live on MLB.tv, the archived versions still won’t play. If you look for them, online, in the Apple TV app, or in the AtBat app, you just get an error message saying the media is wrong or the game is “coming soon”. It’s been over a week, the MLB.com support forum has been full of complaints, yet those games remain unviewable. This is a shame because the Australians did very well. Australia is not that great a baseball nation. In last year’s World Baseball Classic, they lost all three group games in Taiwain. They certainly couldn’t compare to the best European team, the Netherlands. Nevertheless, Australia fought well against the Dodgers, losing 4-2, and they actually shutout the Diamondbacks 4-0. It was a great victory for international baseball, but MLB.tv denies us access. If they ever get around to fixing the problem, it will be in the middle of the baseball season, and few will bother to go back and look. What’s so hard about an audio archive? Then there’s the multi-year complaint about the lack of archived audio on mobile devices. Through Gameday Audio MLB.tv makes available the radio broadcasts of games, often including those in other languages, like Spanish. These are then available archived for on-demand listening on PCs. But the ATBat app (as well as the Apple TV app) only allows live listening. There is no access to the archive. This is crazy. It isn’t a server capacity issue, as the audio files are stored for PC access. But listening on a mobile device makes a lot more sense than listening on a PC, the mobile device is like a radio you travel around with. Moreover, many people have caps on how many MB or GB they can download. Audio uses a lot less than video, which is readily available. Every Spring this issue is brought up on the Support forum, and every year the moderator seems to think the idea is brand new and promises to send it on to the developers. Requests that the moderator explain the developers’ reasoning for not adding the feature have been ignored. It just makes no sense that you can listen to yesterday’s game on a netbook, but not on a smartphone.